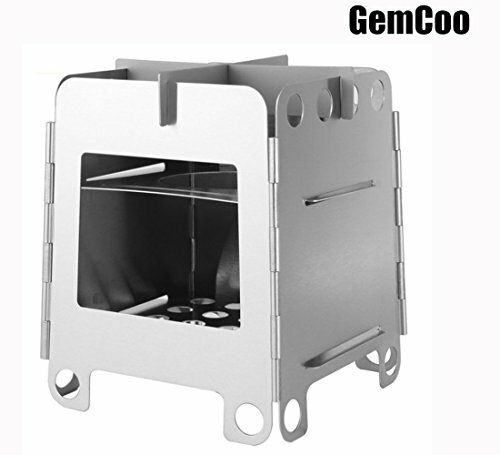 Foldable Camping Wood Stove is a must-have for outdoor activities? ❤This wood stove is crafted from high quality stainless steel,you can use charcoal and solidified alcohol,and fire wood for cooking. ❤User Friendly and Easy To Assemble: a simple and ingenious design with few moving parts to build a perfect cooking platform,the smart mesh and air hole design helps distribute heat,and with open mouth for adding firewood. ❤Unlimited Fuel Sources: Whether you are hiking, camping or just weekend picnic,you can always use natural sources that you pick up along the way such as branches or leaves,as well as solid and liquid alcohol fuel,so you have unlimited fuel source that is free to help you cook a meal. ❤Built tough:made of hardened stainless steel, the stove is meant for rugged backpacking and camping,stably place your cookware. ❤It is foldable and lightweight, very convenient to carry wherever you go. With this compact stove in your backpack, you'll never worry about fuels used out, just cook a meal with the twigs, leaves and branches you collect from the nature, which will not cause chemical emissions. INGENIOUS DESIGN AND EASY TO USE: It's very simple but hinged all around design with card steel plate, just unfold the stove, install two plates and a pin, easy to install within 20 seconds. COMPACT AND LIGHTWEIGHT: Easily collapsible and lightweight, has minimal impact on the weight of your backpack. Folds down relatively flat and comes in a storage bag for convenient carrying, free up more space in your backpack. If you have any questions about this product by GemCoo, contact us by completing and submitting the form below. If you are looking for a specif part number, please include it with your message.